Man, what a characterful piece! I don't know where to even start with this, there are just so many well done elements. I suppose I'll start with the most obvious, the Object Source Lighting. The warp energy coming through the floor at him is fantastic and I really like the color choice on it. I don't think I've ever seen anything like this before on a mini and it really evokes some of the imagery we have seen in artwork and read about. It's not always about fighting demons, sometimes the warp just comes straight at you. The best part of this of course is the way the light from it reflects off the librarian's armor. The pinkish-purple playing on top of the blue really creates an interesting color palette. The skill with which it is painted on there is utterly convincing. The mood on this piece is really set by it. The skin on his face is also very well done, with a nice waxy complexion perfectly fitting for a psyker. I also really like how the blue light from his armor's lenses is reflecting off his scalp and the rebeather he wears. 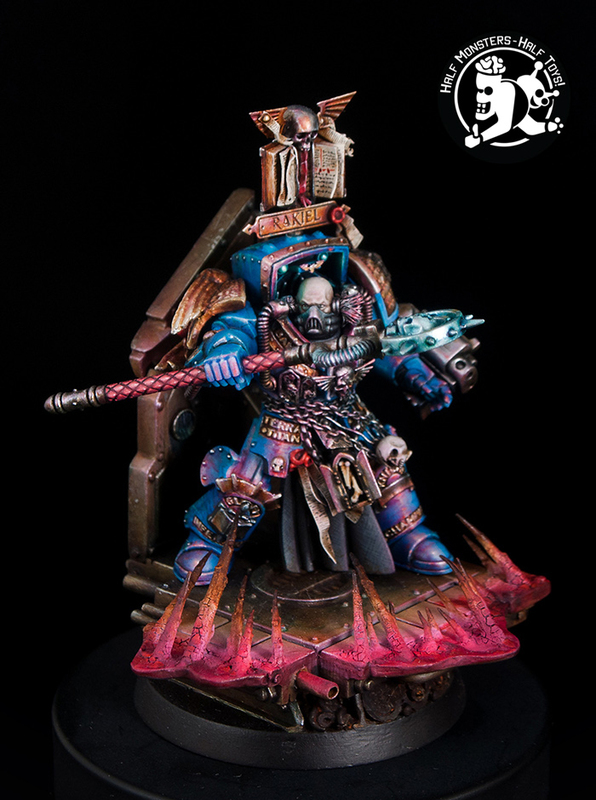 There's just something about how the metallics are done that really nails it for me. I can't really put my finger on it, but it just looks great. 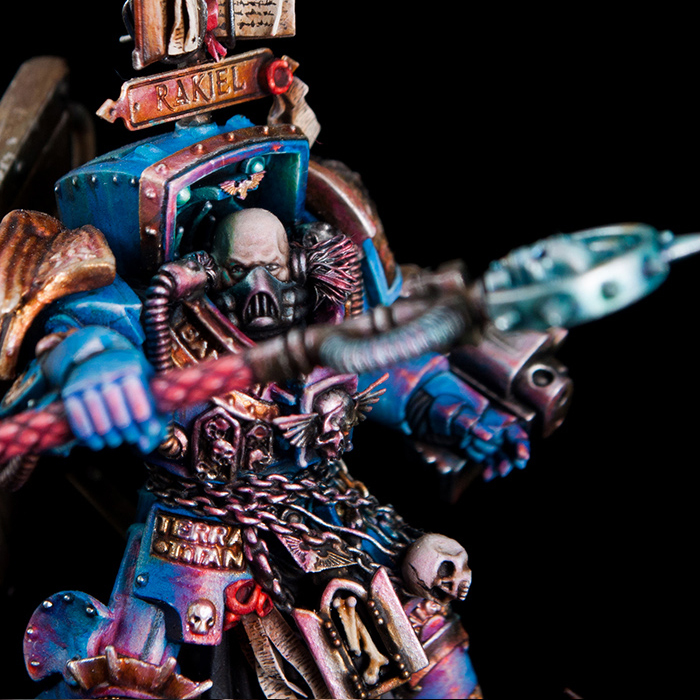 They remind me a lot of how Jakob Neilson paints his metals. The conversion work is great as well, with all of the tiny, tiny wires feeding into his head really standing out to me. It's not something we see often, size appropriate wiring on our models. There's so much going for this mini that I could keep going, so I will just end it here. The only thing I wish I had seen more of is some more obvious Blood Raven imagery. If it weren't for the title of the piece I wouldn't have known what chapter he belonged to, but that's just nit picking.